This is a reminder that the Winter 2019 area-wide management (AWM) treatment window opened Jan.7. You are encouraged to file pesticide use reports (PURs) electronically through CalAgPermits, Agrian, or another system that allows treatments reports to be rapidly filed and recognized. Treatment reminders will be emailed (mailed for those without an email record) about 2-3 weeks prior to the treatment window. In some instances, our contact list may only have contact information for your farm manager, pest control advisor, or pest control operators. If you are not receiving emails, please contact one of your grower liaisons (see contact information below) to receive information about ACP, HLB and your citrus. The Citrus Pest & Disease Program (CPDPP) launched a redesign of its website to provide members of California's citrus industry easier access to the key maps, regulatory updates and events they need to stay informed on the fight against HLB in California. The website is at www.citrusinsider.org. At least 1,024 residential trees had been confirmed as infected with HLB as of January 2019. No HLB-positive trees have been found in commercial groves. The HLB quarantine boundaries and the latest tally of HLB confirmations, updated weekly, is available online at https://citrusinsider.org/maps-and-quarantines/. Help prevent neglected and abandoned citrus from serving as a breeding ground for ACP and the spread of HLB by reporting its location County Agricultural Commissioner's office at (805) 388-4222. If your citrus is not worth the resources required to protect it from ACP and HLB, it may be a good time to consider removing the trees. 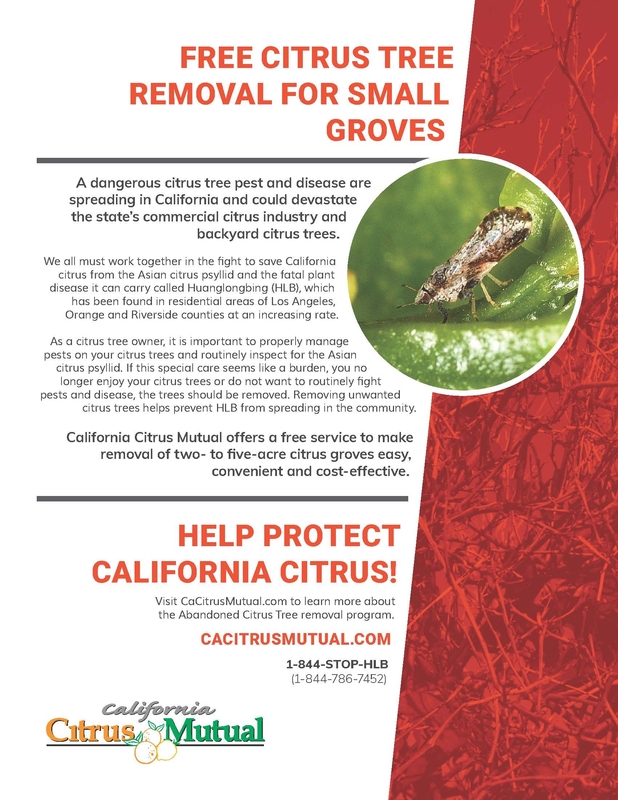 Tree-removal assistance is offered to small growers through the California Citrus Mutual and Bayer's ACT NOW program. For more information contact Joel Reyes at jreyes@cacitrusmutual.com or (559) 592-3790. This year's UC Riverside Citrus Day will be on Tuesday, Jan. 29. Agenda and registration information can be found by clicking here. The joint International HLB and Citrus Virologist conference will be at the Riverside Convention Center in Riverside, CA. Registration and more information can be found here. The CPDPC is charged with advising the state on management of the Citrus Pest and Disease Prevention Program. The CPDPC and subcommittee meetings are open to the public, and options for participation include in person or by webinar and conference call. Click here to view and register for upcoming committee and subcommittee meetings. Attendance is free. Which Way HLB - Huanglongbing and Asian Citrus Psyllid? Now in Marin. The best way to delay arrival of HLB in our area and minimize its impact is to keep ACP suppressed down to the lowest level possible. By treating in coordination with neighbors in an areawide approach, grower ACP treatments can have a greater impact on ACP populations than treating independently and out of sync with neighbors. Best Management Practices, such as making sure all equipment arriving and leaving your grove is free of citrus stems and leaves, can also greatly reduce the risk of HLB-positive psyllids entering your grove. CITRUS REMOVAL PROGRAM: Citrus trees that are neglected or abandoned may harbor ACP and HLB, increasing risk to other citrus in the area. Abandoned and neglected trees may be reported to Cressida Silvers at 805-284-3310, or the county Ag Commissioner's office. The Citrus Matters ACT NOW program may be able to assist in citrus removal. For more information contact Joel Reyes at jreyes@cacitrusmutual.com or (559) 592-3790. There have been no ACP detections in San Luis Obispo County since our last update. The most recent map and totals for HLB detections are posted at the website https://citrusinsider.org/maps/. As of November 16, the total number of trees that have tested positive for the HLB bacterium is 948, still all in LA, Orange, and Riverside Counties. All HLB detections have been on residential properties and the infected trees have been or are being removed. No HLB has been found in commercial groves to date. To clarify the approved mitigation measures for bulk citrus fruit movement, the California Department of Food and Agriculture (CDFA) has updated the Asian Citrus Psyllid (ACP)-Free Declaration form. The current options that allow growers to meet the ACP-free standard when shipping fruit to a different ACP regional quarantine zone are the “spray and harvest,” “field cleaning with machine” and “wet wash” methods. Field cleaning must be done by machine, not by hand. Joint Science and Technology Subcommittee and Regulatory Task Force meeting Thur., December 6 at 1:30 pm in Sacramento. Agenda attached, including link to join by webinar/phone. CPDPC Operations Subcommittee meets Wed., December 12 at 9 am in Visalia. Agenda attached with link to join by webinar/phone. The next meeting of the CPDPC Full Committee will be January 9 in Visalia. Agenda is pending. All meeting agendas and eventually the minutes are posted at https://www.cdfa.ca.gov/citruscommittee/ . All meetings are free and open to the public, and accessible via webinar. 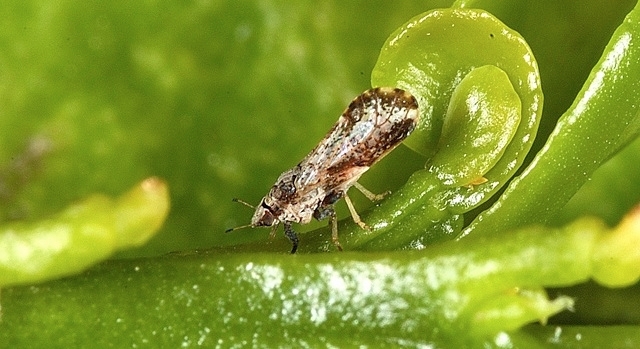 SACRAMENTO — Marin County has been placed under quarantine for the Asian citrus psyllid (ACP) following the detection of one ACP in the City of Novato. The entire county is included in the quarantine zone. The ACP is an invasive species of concern because it can carry the disease huanglongbing (HLB), also known as citrus greening. 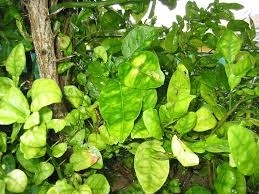 All citrus and closely related species, such as curry leaf trees, are susceptible hosts for both the insect and disease. There is no cure once the tree becomes infected. A diseased tree will decline in health and produce bitter, misshaped fruit until it dies. In California, HLB has been detected at residential properties in Los Angeles, Orange and Riverside counties. This plant disease does not affect human health. Residents with backyard citrus trees in the quarantine area are asked not to transport or send citrus fruit or leaves, potted citrus trees, or curry leaves from the quarantine area. For commercial citrus, the quarantine prohibits the movement of citrus and curry leaf tree nursery stock, including all plant parts except fruit, out of the quarantine area. The quarantine also requires that all commercial citrus fruit be cleaned of leaves and stems prior to moving out of the quarantine area. An exception may be made for nursery stock and budwood grown in USDA-approved structures that are designed to keep ACP and other insects out. ACP quarantines are in place in Alameda, Contra Costa, Fresno, Kern, Kings, Madera, Merced, Monterey, Placer, San Benito, San Joaquin, San Luis Obispo, San Mateo, Santa Clara, Solano, Stanislaus, Tulare, Yolo, Imperial, Los Angeles, Orange, Riverside, San Bernardino, San Diego, Santa Barbara, and Ventura counties, as well as Marin. Inspect trees for the Asian citrus psyllid and Huanglongbing monthly, and whenever watering, spraying, pruning or tending trees. Psyllids are most noticeable when new leaves are growing on the tips of the branches. When grafting citrus trees, only use registered budwood that comes with source documentation, such as the budwood offered through the Citrus Clonal Protection Program. VISALIA – Last week's California Citrus Conference marked a major milestone for growers, and it wasn't just the 50th anniversary of the Visalia-based Citrus Research Board (CRB). It was a resounding revelation that new research may cure the greatest threat to the citrus industry in the next few years. 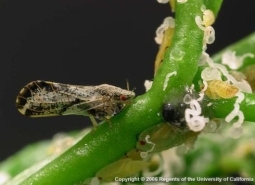 Michelle Heck, a molecular biologist with the USDA Agricultural Research Service, discusses her research to breed a new citrus pest that does not transmit the fatal tree disease known as huanglongbing. Photo by Michael Alvarez. Michelle Heck, PhD, told the crowd of citrus growers at the Wyndham Hotel on Oct. 10 that her team might only need that much time to inbreed a generation of Asian citrus psyllids that are incapable of transmitting the deadly tree disease known as huanglongbing (HLB). The disease has already destroyed China's citrus industry, decimated Florida and Texas growing regions and is currently killing the citrus industry in Brazil. Heck, a molecular biologist with the USDA Agricultural Research Service, was the first to lead a team of scientists to study the proteins involved in the interaction of the pest, plant and pathogen. One of those proteins creates a blue color in the blood of some psyllids. Her research revealed that psyllids containing the blue protein are far less efficient at transmitting HLB to the plant than others. She then bred those psyllids and took their progency and raised them on orange jasmine hedges, better known as Murraya, a plant the psyllids are attracted but is HLB resistant. The combination of the pest and plant reduced transmission of HLB to healthy citrus leaves from 32% to 2.9%. Heck said the next steps are to continue breeding the pests that are poor transmitters of the disease to create a line of psyllids that do not transmit HLB at all. She said it would take another two years to breed an “optimized line” of the psyllid but once that was complete, that line could begin mass breeding for release. One grower asked if the non-transmitting line of the pest would be considered a genetically modified organism, or GMO, a distinction that could hurt fruit grown in groves with the new pest. Heck said all of the psyllids would be bred natuarally, so there is no genetic alteration of the insect itself. “This is something the anti-GMO groups should feel good about,” Heck said. 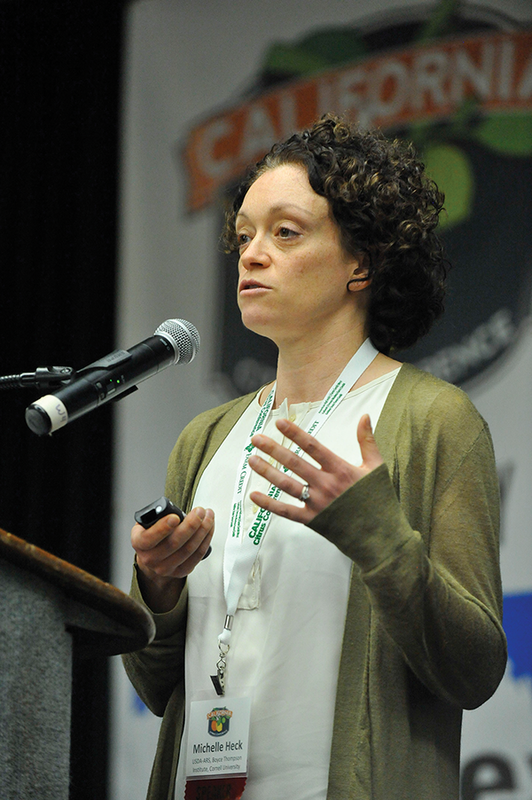 Victoria Hornbaker, Statewide Citrus Program Manager for the California Department of Food and Agriculture (CDFA), called the current HLB situation in California a best case scenario. She said the Citrus Pest and Disease Prevention Program's (CPDPP) No. 1 priority is to quickly detect and remove diseased trees. Shortly after the discovery of the first HLB tree in 2012, California's myriad of citrus agencies worked together to quickly implement measures to control movement of fruit and nursery stock, monitor and suppress the ACP population, and begin working on ways to detect the disease and possibly cure it. “Instead of all commercial groves being covered by a quarantine, we said we're going to quarantine the whole state,” Hornbaker said. By limiting the movement of citrus in and out of different quarantine zones, there is less likelihood of transporting trees from an infected area to an uninfected area. If any infected trees are discovered, they are removed, destroyed and replaced with a healthy tree. There are many early detection techniques (EDTs) being studied throughout the country, including looking for patterns in leaves, chemicals produced by trees in response to HLB, and studying molecules of the bacteria causing the disease. A recent analysis of these EDTs showed that most are about 95% effective in identifying an infected tree, and that losing 5% of healthy trees is an acceptable loss compared to devastation caused by the disease spreading unchecked. While early detection methods of ACP are still being perfected, the fight to control the spread of the psyllid is not. After research identified the microscopic parasitic wasp radiate terminaxia as the natural enemy of the psyllid, they began working to mass produce and release them. To date, more than 11 million wasps have bee released in citrus growing regions since 2013, the closest being in Kern County. Early detection technologies (EDTs) are tests that indicate the presence of disease before signs or symptoms of the disease can be seen. In the same way that a doc-tor measures a patient's blood pressure to look for heart problems, a grower might use a trained “sniffer” dog to detect changes in a tree that looks healthy but has huanglongbing (HLB) disease. By using the EDT, the grower is able to uncover HLB earlier, and can decide on an early, cost-saving course of action. In the case of HLB, there are many EDTs under development. 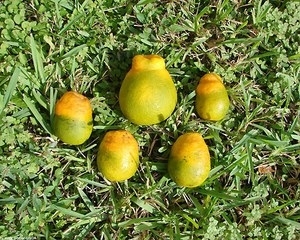 Some of them look for patterns in the microorganisms that live on the citrus leaves (Leveau snapshot); some look for patterns in the chemicals that are produced by the tree in response to HLB (Pourreza, Davis and Slupsky); and others look for the molecules that the bacterium injects in the tree to cause disease (Ma). A description of some of these EDTs can be found on the Science for Citrus Health website. Why do we need EDTs for HLB? To understand why EDTs are needed and what their potential value is, it is necessary to understand the difference between the incubation period for a disease and the latent period. The incubation period is the time between exposure to the pathogen and the appearance of symptoms. The latent period is the time between exposure and the newly-infected host becoming infectious. Huanglongbing (HLB) has a long incubation period and a very short latent period, which means that a tree can be dis-eased for a long time without showing any visible symptoms, while being infectious for a large fraction of that time. Even if a tree does not seem diseased, it can serve as a home for the bacterium (Candidatus Liberibacter asiaticus, CLas) that causes HLB. If a psyllid feeds on the infected tissue of a tree (with or without symptoms), CLas that is present in the leaf tissue can be picked up by the insect and transmitted to other trees when the psyllid moves on to feed. Information from an EDT can help a grower detect the disease in a tree a long time before it would be detected by eye. This cuts down the time psyllids are able to feed on it and transmit the disease, slowing the spread of HLB to neighboring trees. Why is it important to remove infected trees as early as possible? If a tree that tests positive for CLas is not treated or removed, the bacterium will spread throughout the tree. Over time, an increasing proportion of the tree's tissues will become infected, increasing the chances that a psyllid will become infected upon feeding, and subsequently spread the infection to healthy neighboring trees. If the infected tree is removed, there is no opportunity for psyllids to feed on the infected tissue and spread the disease. Once CLas is detected, tree removal is the only surefire way to prevent the spread of the infection, and it is extremely time-sensitive. The sooner an infected tree is removed, the lower the chances that psyllids will get infected. The savings associated with early infected tree removal will be proportional to the amount of surrounding trees that would have been infected with CLas due to that tree, and the number of months that it would be left on the ground. Who is working on the project? Several research teams in different universities and research stations, supported by a variety of funding organizations, have been working on the development of a variety of EDTs. These EDTs, designed under laboratory and greenhouse conditions, are being validated under field conditions in Texas and Florida. In California, where HLB has not been detected in citrus orchards, samples of different citrus varieties have been collected from healthy trees and trees affected by other diseases from all over the state. These samples are being used to calibrate the EDTs, and to test if they can distinguish between healthy and HLB-diseased trees, and between HLB-diseased trees and trees affected by other common citrus diseases. Dr. Neil McRoberts and his team at UC Davis are evaluating the data from these experiments and providing support to the EDT researchers. What are the challenges and opportunities? Currently, regulations require HLB infected trees to be removed if a certain amount of CLas DNA is detected in leaf samples through polymerase chain reaction (PCR). However, CLas is unevenly distributed in the sap of citrus trees, and the leaf samples collected might not be PCR-positive even though the bacterium is already present elsewhere in the tree. EDTs offer the possibility to detect infected trees before they are PCR-positive, so they could be removed earlier in the HLB epidemic. Therefore, the value of EDTs relies on the voluntary removal of EDT-positive trees before the law requires them to be removed. No EDT gives perfect diagnostic results. Sometimes healthy trees will produce EDT scores that look like diseased trees (so-called “false positives”). Removing such trees will result in an immediate financial loss. However, because the economic damage caused by leaving an infected tree in place is much bigger than the value of a healthy tree, using an EDT to guide decisions has the potential to result in a long-term economic benefit to individual growers and communities, by reducing the spread of HLB. Losing a few healthy trees along the way is the unavoidable cost of stopping the disease from spreading. Like-wise, some trees will seem healthy based on EDT scores but might end up showing symptoms (“false negatives”). The proportion of true positives, false positives, true negatives and false negatives represents the accuracy of a diagnostic test. Dr. McRoberts' team is analyzing the accuracy of the EDTs, and preliminary results suggest that the best performing EDTs could be correctly determining the status of the trees 95% of the time. The results of this analysis could be used to foster the adoption of EDTs among the citrus grower community, promoting the idea that the sooner infected trees are detected and removed, the smaller impact HLB will have on California's citrus production. Unless there is sufficient cooperation in integrated management of HLB by removing infected trees as early as possible, controlling the ACP on an area-wide scale, and using certified plant material, the California citrus industry is likely to suffer un-sustainable economic losses to HLB.